Restless, sensitive Cancer-Monkeys are prone to excess experiences. They differ in sharp mind, impulsiveness, and vulnerability. Famous for their changeable temper, they are capable of unpredictable actions. The union of a vulnerable Cancer and restless Monkey is a contradictory combination that gives its representatives a complex character. The mood of these people is changing so quickly that others can only guess about the causes of their despondency or sudden joy. According to the combined horoscope Monkey-Cancer — a mysterious and unordinary personality, capable of deep feelings. Can not live monotonously, strives to fulfill all of his desires, while being cautious and hypochondriac. Not too self-confident, afraid to seem ridiculous and ridiculous. A clever, inventive Monkey is full of ideas and plans, easily takes on the implementation of the most impracticable projects. But the suspicious, insecure Cancer is afraid to make important decisions. However, these two signs successfully complement each other, form a harmonious union, successful in entrepreneurial activity. Monkeys-Cancers are wonderful organizers, good leaders and successful businessmen. They have an unmistakable sense of profitable transactions, they are able to concentrate on current problems, and most importantly, they are safely resolved. At the same time they are not fixated on money, they are easy to spend, they like to have fun and make spontaneous purchases. Eccentric and unbridled in their desires, often presented with surprises. Cancer-Monkey is a big child, a sweet and naive child. The man of this combination lives in a world of dreams and fairy tales, does not want to grow up. At the same time has incredible intelligence and excellent memory. Do not forget and do not forgive others the slightest missteps. Perhaps he does not express his claims aloud, but delicately notes all the details. Differs good-natured character, does not like to quarrel and find out the relationship. Tactical Cancer-Monkey makes a good impression: it’s not embarrassing to appear in any society with it. However, his benevolent mood can be sharply replaced by depression and disappointment. Sometimes he needs solitude, he needs time to sort himself out. He does not tolerate any restrictions: he carefully protects his personal space. Talented, gifted Cancer-Monkey is famous for its outstanding abilities: developed aesthetic taste, lively imagination, rich imagination. From it you can not wait for responsible execution of monotonous work, but you can entrust any creative project. Difficulties do not frighten him, on the contrary, inspire feats and accomplishments. Inventive Monkey will always find a way to get around obstacles, and hard-working, hard-working Cancer honestly performs its duties. Monkeys-Cancers know how to extract profit from their fantasies: businesslike, deft and astute. In addition, they are distinguished by kindness and disinterestedness: no one is denied assistance. Communication with them is filled with pleasant emotions, but others should remember the unpredictability of these people. Mysterious Monkeys-Cancers are of great interest to those around you. Behave gently and tactfully, try to please everyone. They make an impression of gentle, vulnerable and slightly shy people. True, over time they gain self-confidence, become demanding and even a little tyrannical. On a love horoscope Cancer-Monkey is a capricious, unpredictable partner. Jealous, suspicious, trying to tie a loved one to himself in every possible way. 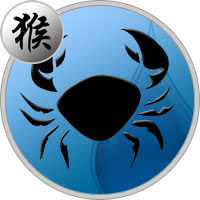 Cancers-Monkeys are pleasant in communication, with them it is easy and fun, but for the time being. At home, they are demanding: they do not endure chaos and disorder. They manifest themselves as economic, self-motivated people. Control the life of their loved ones, do not hesitate to give directions, require submission. In general, Cancer-Monkey is a good family man, although sometimes it gives his half of trouble: flirting and flirting crookedly. Close people should sensitively catch changes in his mood, praise and support in all endeavors. Ambitious Cancer-Monkey is set for a successful career, strives to take place in his profession. He is an excellent strategist, an intelligent and astute person. He does not just realize the advantages of a particular profession, but intuitively determines his vocation. He chooses the matter to his liking, but he also does not forget about material prosperity. Has a developed imagination, finds non-ordinary solutions to problems. Famous for its business acumen and a great sense of money. It can take place in any field, unless it loses interest in the matter. The vulnerable Monkey-Cancers are afraid of failures and defeats, they take criticism seriously. They need faithful and devoted helpers capable of tolerating the characteristics of their character. But these talented people are full of ideas, the surrounding people only need to correctly implement their ideas. Working together with Cancer-Monkeys can be successful and fruitful, if they do not contradict and praise all the time. They will be able to lead their team to victories: Monkeys-Cancers are not just good leaders, but also sensitive, considerate people. The Cancer man, born in the year of the Monkey, is full of ideas and bold plans, but does not have enough mental strength and diligence to implement them. Too immersed in my dreams and fantasies to actively act. He needs an experienced and reliable mentor who can translate his ideas into reality. He prefers to lead a quiet, measured way of life, although sometimes he performs rather insane acts. It can suddenly break out on a trip or make a romance with a colleague. But basically it’s a reliable and predictable man in his actions. Waiting for a woman understanding, support, is aimed at creating a strong family. It is a great pleasure to spend time with children, this is a very gentle and caring father. For the Cancer-Monkey woman, the interests of the family are always in the first place. He has unlimited patience, tries to surround loved ones with love and care. At the same time she is quite successful in her profession, she is considered a good professional. Talented women prefer creative work, they like to invent and create something new and original. They are collected and purposeful people, though not always fully self-confident. The surrounding people like their soft nature, the ability to listen and give valuable advice. However, the monstrosity, unpredictability of the Monkey often manifests itself at the most inopportune moment. A good woman can become a desperate burner of life, but not more than a couple of days.